RCC was established in 2002 with the aim of providing commercial and contractual support and assistance to BMS and other Specialist Contracting companies. 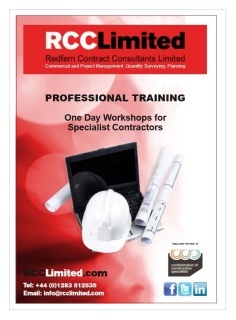 As such, RCC’s training focuses very specifically on the commercial and contractual needs, problems and opportunities that specialist contracting companies encounter every day. The programme consists of an integrated set of directly targeted and high quality, intensive full day training courses with the aim of providing clear and practical understanding using real-life, common industry sector reference material and experiences. Our trainers and operational team have all worked in the specialist contracting sector of the construction industry so we are well aware of the risks and abuses specialists can be exposed to when contracting. We strive to provide quick effective solutions to address any problems and provide practical help and guidance for long term protection and profitability of your business. Managing the value and costs of specialist construction work including the procurement and management of subcontracting.